You feel like you “should” start eating healthy but you don’t want to. Here are 3 keys that will help you WANT to make better choices for your health. Cardboard, weeds, twigs, styrofoam. These “affectionate” terms for healthy food are oftentimes not much of a stretch. A rice cake, for example, has about as much flavor as any of those inedibles, and yet it is seen as a good option when trying to watch what you are eating. In fact, choosing a rice cake over a cookie would earn you a blue ribbon in some circles. No wonder many of us don’t want to start eating “healthy”! If you have found yourself desiring to make better food choices but not able to push yourself to take the plunge, this post is for you. Here you will find suggestions and encouragement to jump in, no rice cakes needed. As humans, we like to do things we enjoy. We like tasty food, riveting movies, and vacations that make us forget we’re all grown up. We don’t need our arms twisted to do what we love. Then there’s washing laundry, filing paperwork, and mowing the lawn. Doing things we don’t enjoy– well, that takes some serious motivation. The incentive can come from liking clean clothes, needing to keep our jobs, and not wanting to require a machete to walk through the backyard. What about eating healthy? When choosing rice cakes or kale, it’s not an easy decision. We may shy away from choosing the foods we know are good for our health for a number of reasons. But, at the core, our motives are about avoiding discomfort and seeking enjoyment. We magnify the challenge of changing our diet and downplay the consequences of staying the same. Fear the deprivation of our favorite foods. Dread the obligation to eat boring health food. Feel anxious about losing a coping mechanism. Worry about the work required to make a change. Convince ourselves that we can avoid health issues. Sound familiar? If so, there is nothing to be ashamed of. Each bullet point shares a legitimate concern that many others can also relate to. Change is scary, especially when we don’t know where to start. When the road ahead looks too long, it is easy to throw in the towel before we even start. But, there is great hope! 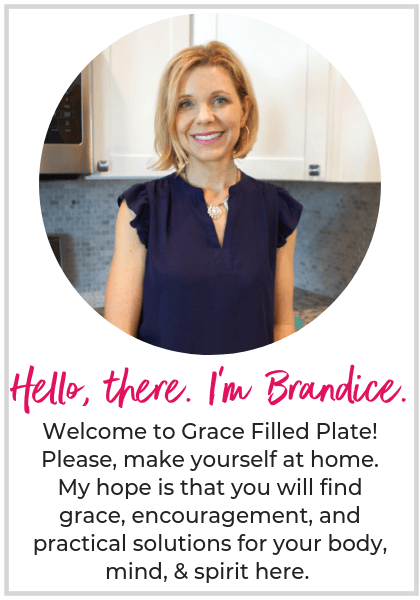 Diets overwhelm… but a grace-filled approach to eating flexes with you. Keep reading, I think you’ll be encouraged by how close you are to starting to eating healthy! As we discussed above, what motivates us matters. It’s not uncommon for us to give up long-term success for short-term relief. This is especially true when we magnify the challenges of change over the rewards. Here, we will tap into our motivation by making the end result feel well worth the current sacrifice. While we daydream that the future will be bright, our present best represents what lies ahead. In other words, if we keep putting off what we need to do today until tomorrow, tomorrow has a way of never coming. Take a moment to imagine yourself 5 years from now. Nothing has changed, you are still doing the same old thing. Ouch. While I know this is not fun to contemplate, please don’t waste this opportunity to connect with the pain. It will fuel your change. This is how I personally got “over” a problem food I was faced with. Rather than seeing it for its creamy deliciousness, I saw how it took me to a place that I did not want to go. Yes, it started out as “just one bite” but it never ended well. I needed to see the end from the beginning. This travel through time teaches us that the temporary discomfort of pushing past our current habits is nothing compared to dreams lost in the murky water of regret. He’s cute but we don’t want to be stuck on his hamster wheel. Now, imagine that TODAY, you decide to do things differently. It’s not that you suddenly start eating perfectly, but you put feet to your best intentions and start to make some better choices. This week you make one small tweak; next week you make another. Weeks, months, and 5 years go by of these small, sustainable changes and you find yourself different, in a really good way! Allow yourself to think on these pictures. Meditate on them until they are easy to recall. They will fuel your fire when standing at a fork in the road with a fork in your hand. If eating healthfully means you are sentenced to a diet of boring and tasteless food then you’re going to have a hard time convincing yourself to upgrade. When you want to eat better, eating better better be appealing. You don’t need to settle but you will need to experiment. There may be meals that fall flat but there will surely be greatest hits. There are a ton of resources available online to coach you through healthy and easy cooking. Simply Google your favorite meal + healthy + easy. Pizza, burgers fries, tacos, chicken nuggets, you name it. There are recipes out there to suit your tastes. Learning how to cook vegetables turned me into a raving fan. Frozen Brussels sprouts and fresh, roasted ones are not even in the same category. Extra touches such as a sprinkle of feta cheese, toasted nuts, or fresh herbs can take your meal from so-so to succulent. A beautiful garnish, a splurge from the produce aisle, or serving your dinner on plates rather than from pots will help you to embrace the new changes where indulgence doesn’t have to mean unhealthy food. The take-home message is– don’t expect yourself to want to eat nourishing foods if they are not delicious. We’d never expect to go from the couch potato to a marathon runner in 4 weeks. Or, we wouldn’t commit to playing the piano at our cousin’s wedding next summer when we’d never touched those ivory keys. In much the same way, the big undertaking of going from a junk food and fast food diet to a lean and green one is NOT a transformation that will happen overnight. Just like training for a marathon or learning to play the piano, if getting from point A to point B seems utterly impossible, we’d probably bow out before we even committed to start. If you want to start eating healthy but you really don’t want to, then maybe you are trying to do too much at once. Rather than going gung-ho, think about what you could actually get on board with doing. Yes, I know that there is something really “Hollywood” about the Cinderella transformation but those stories are just a fairy tale for most of us. What we need are simple, broken down steps that will walk us through the process of change in a sustainable way. Ponder what small change you are 100% willing (and hopefully excited) to do and do THAT. That’s it! Review the following 3 points and choose one area to focus on. Then read the suggested posts to support your efforts. 1. Tap into your motivation: Connect with what matters MOST. Set a timer for 15 minutes and journal about your priorities. Don’t filter your responses, just write, write, write. After 15 minutes of journaling, reread what you wrote and highlight all points that stand out to you most. Write your Top 3 on a 3×5 card and review them each day. 2. Make it appealing: Find healthy food that you WANT to eat. Jot down your 10 favorite foods/meals. Choose 3 that you feel like you can replicate and look for healthy substitutes online. Schedule one meal each week for the next 3 weeks. You may also want to check out my Pinterest Healthy Eating Boards where I have curated a ton of good-for-you recipes. 3. Break it down into steps: Pick a small step you can start TODAY. Set a timer for 10 minutes and write down every healthy habit that you think you would possibly be interested in doing. Review your list and choose your Top 10. Now rate those 10 in order of appeal and potential impact from 1-10. Look at your #1. Do you feel 80-100% confident that you could successfully make this change next week? If not, adjust. For example, if you are only 70% confident that you can eat 5 servings of vegetables, how confident are you that you can eat 4? Consider purchasing The Ultimate 12-Week Healthy Habit Goal Setting Planner which will help you break down your big goals into manageable steps. I hope these ideas have helped you to see that you DO desire treat your body well (after all, you wouldn’t be reading this post!) and that there are ways to take great care of yourself, no styrofoam required. Baby steps are definitely key! I’ve been working on a healthier lifestyle since 2015 and I still haven’t perfected it yet. I set a few goals for the year- like making my plate 50% vegetables for lunch and dinner. It’s only the 11th and I’ve failed a bit, but it takes time to get into a good groove! Love those goals! The times you don’t hit your goal are all part of the process. We don’t change overnight. You are doing a good work by putting one foot in front of the other and taking one step at a time. It’s funny because 5 years from now you’ll back and it will feel like you did do it quickly! LOVE this post! After experiencing the infamous “FRESHMAN 15” I found myself constantly in this crazy battle with food. Don’t eat too many carbs, but keep your energy high with “clean sugars”, like what the heck are “clean sugars”?! Anyway, eventually I did what you said in this post, break your goals down into more manageable ones, and started letting go of easier things like dairy, and junk food. Found myself 15 lbs slimmer in two months. I aprreciate how candid & encouraging you are & I think more women should get this info! Thank you, Anna Mae! It never ceases to amaze me how quickly those seemingly “small” things add up. Such a great success story. Thanks for sharing!